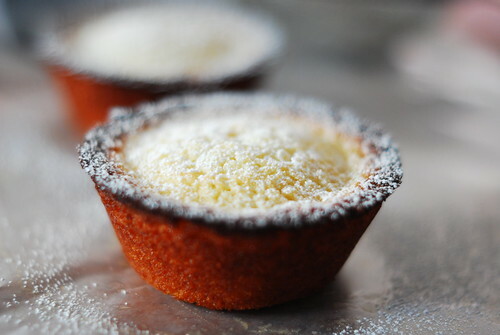 Want to Eat my Friand ? Friand, originally uploaded by Lameen. No ! that isn't misspelt, it is Friand and in short it's a popular Australian version of a cup cake. However, for Friand, egg whites and ground almonds are used instead, as opposed to just whole eggs and only flour. First up, melt the butter and put aside and pour your 1 teaspoon of vanilla extract in to infuse together with your grated rind of from 1 unwaxed lemon. Next, sift the flour and the ground almonds into a bowl with the caster sugar already in. Lightly beat the egg whites but don't let it turn into peaks - just use a fork until it bubbles up. Then pour your egg white mixture into the dry ingredients (flour, almonds and sugar). Finally, pour your melted butter and vanilla lemon infusion into the rest of the ingredients and mix well until properly combined. Next, pour into the muffin holes, using just 10 and not all the 12 muffin holes. Bake for about 8 minutes and then turn around the pan and bake for another 8 minutes until the friands begin to get brown and come of the sides of the muffin holes. I suggest that before they get a little dark around the edges like the ones above, you put a grease proof paper or oven foil on top to stop the friands from burning. Check to see if they are ready by poking a clean unused toothpick (hmm !) into the centre - you want it just done and not dry as the combination of almonds and lemon usually make this a moist heavenly experience. Once cool, dust with icing sugar and really enjoy this simple and wonderful culinary experiment. Preheat your oven to 180C and line a non-stick large baking tray with baking parchment. Pour the canola oil into a small pan and once it begins to get hot put the tablespoon of butter in, as well as the 150ml of honey (TIP - pour the honey into the same measuring jug you used for the oil and the honey will be easier to pour). As soon as the butter has melted and the canola oil, honey and butter mixture flow as one, then take of the heat. Measure the rest of the ingredients and pour into a large bowl and then pour the oil mixture in and stir until evenly coated. Place on the lined baking tin and put into the oven. The whole baking time should take about 20-25 minutes but I advise you to check it every 6-8 minutes so that it doesn't burnt - the combination of honey, oil and oats creates a sugar mass that burns easily, so watch it closely. As soon as it is done it should be golden and not burnt. Take it out and whilst it cools try to break it gently - don't leave it for hours as it will be hard to break later. Once ready, pour the granola into an airtight container and it should last for about 4 weeks - mine lasted just under 2, as my daughter fell in love with it and wife mixed it with ice cream. For breakfast, it works well with a little slightly hot milk, topped with thick natural yoghurt (called Bulgarian in South Africa) and fresh fruit like strawberries or/and banana. 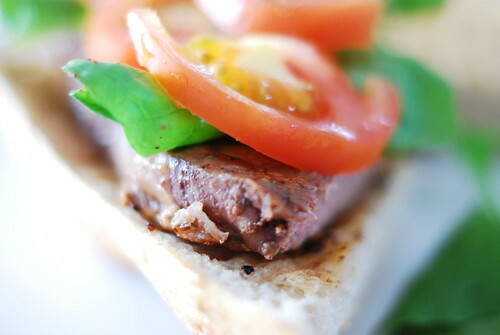 Steak Sandwich, originally uploaded by Lameen. 10 minutes before you want to start cooking your steak, take it out and season lightly with some salt and black pepper. Put a knob of butter into the grill pan just before you place the steak in . For well done, which is how I like it, grill each side for 5 minutes each. Once done, place the steak on something which would let the juices flow out for another 5 minutes. As your steak rests, cut your baguette into 2 and grill them in the same pan. Wash your tomatoes and slice them very thinly and wash your rucola and dry it out. Prepare your base by mixing together a dessert spoon of yoghurt, a teaspoon of dijon mustard and some crushed garlic and chilli flakes. Spread this on the grilled baguette, place your rested steak on top, followed by the sliced tomatoes and rucola, then place the other slice of baguette on top and enjoy. The steak should be succulent and shouldn't require too much gnashing to rip the meat if done right. Inspired by a 7 year itch to have a great steak sandwich with ideas from Pret a Manger's cookbook "Food on the Move".